Netanyahu in Davos: Not only does Iran spread terror all over the world, it openly says it will use its weapons to destroy Israel. 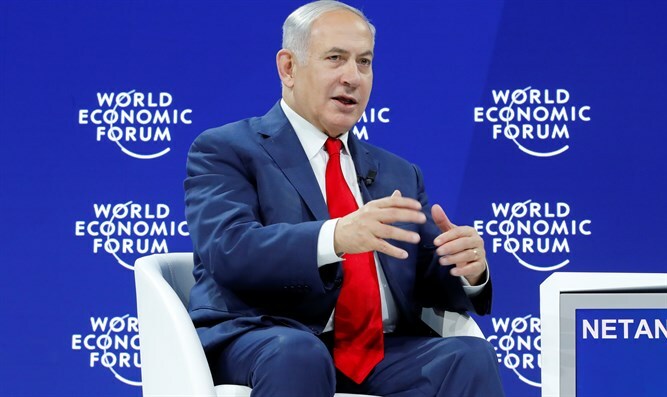 Prime Minister Binyamin Netanyahu spoke on Thursday evening at the World Economic Forum in Davos, Switzerland. “What they can do today, at best, is enrich uranium for one bomb. Under the current agreement, they will be able to enrich enough uranium for a hundred or two hundred bombs," the prime minister warned. "They will be able to break through, to quickly create an arsenal of nuclear weapons without any international agreement preventing them from doing so. In fact, the agreement allows them to do so." "I do not care if the agreement is fixed, cancelled, or kept. What is important to me is to prevent Iran from obtaining a nuclear arsenal. Because not only does Iran spread terror all over the world, Iran openly says that it will use these weapons and any weapons it possesses in order to destroy Israel. We will not let that happen,” he reiterated. “We also appreciate the fact that you confront Iran's aggression with us and with other parties in the region as never before. I've never seen the realistic alliance between the United States, Israel and your other allies in the region as strong, as unified, as it is under your leadership,” added Netanyahu. So far, European countries have failed to see eye to eye with Trump on the nuclear deal and have expressed their support for the deal even as Trump has criticized it.